2017 Update: Artisanal Sorbets has become Charlie's Sorbet Co. New packaging should be out soon. 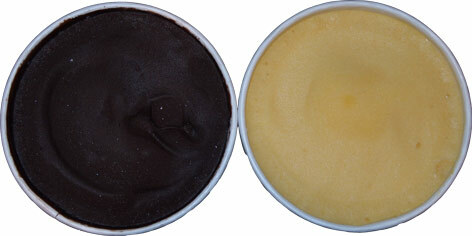 It looks like Chocolate has become Midnight Chocolate and Passion Fruit is now Passion Fruit Lovin'. There is also a Double Coconut flavor. Like so many other purveyors of small batch frozen delights, Artisanal Sorbets is based out of New York City. Their tag is "all natural, gluten free, dairy free, vegan". Since I'm rarely in NYC, the owner was nice enough to send over a pair of free samples to try. Mmmmm, the chocolate smells really rich. The passion fruit smells like pineapple. I try to scoop some out but realize they need to temper for awhile. I do scrape enough of the chocolate for it to make me think about chocolate chips. I wait about ten minutes and try scooping again. I take a tiny snip of passionfruit as I put some in my bowl and WHOA. I take one more small scoop and WOW does that have a lot of bite. Wow. I'm awake now I swear. It reminds me a lot of Talenti's Alphonso Mango. Passion fruit isn't really my style, but if you want something bright, yeah, this is very bright. I was trying to keep them separate. Ok, back to the chocolate. It's now been about 15+ minutes and it's been out long enough to be close to the consistency it should be. A take a few small bites to savor the flavor as it to is very potent. Nah, potent is the wrong word. Robust? Strong? It's like the strong chocolate filling you might find in a high end dessert. You don't inhale those desserts, you take little bites to savor it. 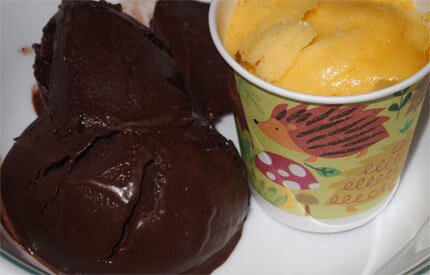 Wait, I got it, the chocolate reminds me of Gelato Fiasco's Dark Chocolate Noir Sorbetto. This is a straight chocolate so it's not as dark as the GF version, but it's definitely a nice, rich, complex chocolate, like some fancy chocolate pudding. The neat thing about flavors like this is that it's an easy fix if you are hurting for a chocolate fix. Oh, and you'll forget the chocolate is dairy free once it hits the right texture, but I think we've learned that's the beauty of a good, non-fruit sorbet. Considering I just compared these two samples to premium brands, I'll call this one a win. 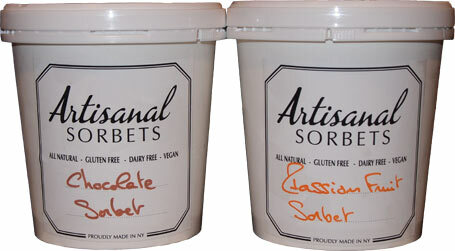 Nice job Artisanal Sorbets, we wish you the best! Normally I read "Gluten Free, Dairy Free, Vegan" and think why bother, but that Chocolate flavor looks damn good! Thank you for the great review. As a note we only use 100% Passion Fruits (no concentrates) so it can have a kick to it. As for the chocolate we use an imported European chocolate which is made from 65% Cacao. If your readers have any questions they can always email us at info@artisanalsorbets.com.